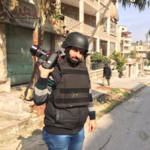 Freelance journalist from Syria, based in Aleppo. 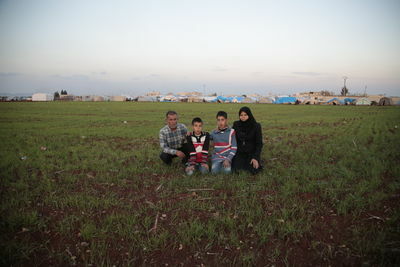 March 4, 2016 Aleppo, Syria On the Syrian side of the Bab al-Salama border crossing to Turkey, the Turkish red crescent established a new makeshift camp to shelter refugees who escaped the airstrikes and battles in Aleppo. 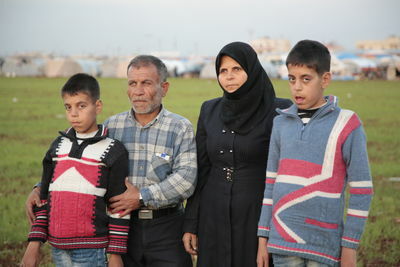 The Youssef family is among thousands of refugees who made it to the camp. The family has been through misery. “Some people haven't received a tent. In my case I could have been waiting for my turn till now”, says Mohamed Youssef, 46. 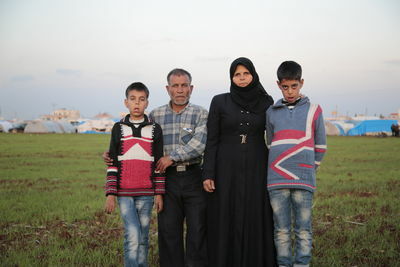 Mohamed who arrived with his wife Khadijah 43 and his two children Mustafa 14 and Ahmed 11, is feeling lucky just to have received a tent. Both sons suffer from a neurological birth disorder and they need special care. Before the uprising against the Syrian President Bashar al-Assad, Mohamed used to work as a delivery truck driver. Now he's jobless and has no income. 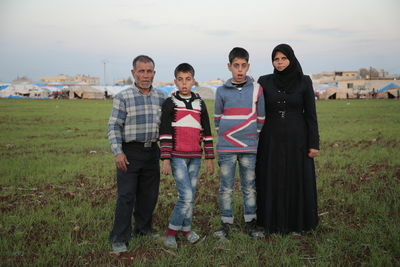 The family who lived in Minaq, in northern rural Aleppo, had to relocate to central Aleppo in 2012 when fierce fighting erupted between Syrian regime forces and the Free Syrian Army for control of the nearby Minaq Military Airbase. 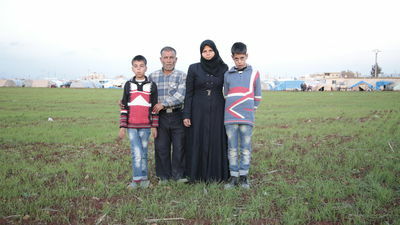 When the FSA took over the base and neighboring towns the family went back to their home in Minaq, only to flee again in February 2016 after the Kurdish YPD militia, backed by the Syrian regime army, launched an offensive and retook control over the area. “We stay inside the tent, if we are bored we come outside for some time and then we go back inside again, we have nothing to do”. Turkish authorities are keeping the border crossing near Kilis closed. 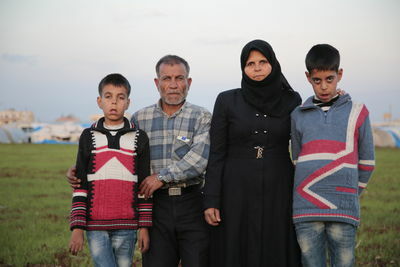 Mohamed, his family and thousands of refugees have no other place to go. They have been settling into the makeshift camp since mid February. 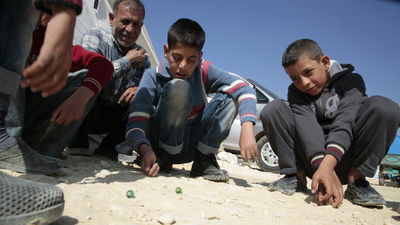 Having not much to do, the children spend their day with neighbor friends playing marbles. This is the only amusement available to them. 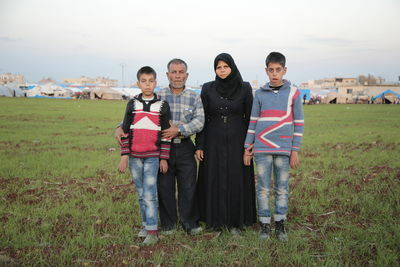 November 20, 2015 Aleppo, Syria Um Abdul Rahman al-Issa, a resident of Tariq al-Bab district of Aleppo, is desperate and worried about the condition of her family in the upcoming winter. 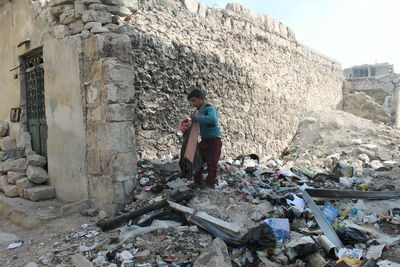 The mother of 5 had to leave her hometown in the neighboring district of Jabal Badro following an airstrike that destroyed her house over a year ago. Her father, her husband (Ibrahim al-Issa) and her daughter died in the airstrike. Um Abdul Rahman is now taking shelter with her 5 children in a house in the Tariq al-Bab district, in the rebel controlled area of Aleppo. She depends on the very few donations she receives from her poor neighbors in order to feed her children, but she is very worried about keeping them warm as winter is coming. 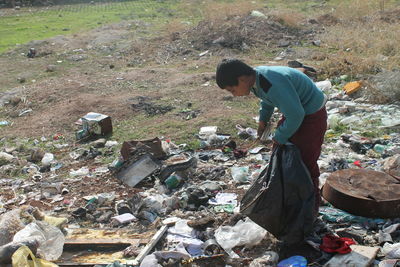 She said that she struggled to survive last winter and that she’d rather and her children die this year to avoid being in the same situation again. 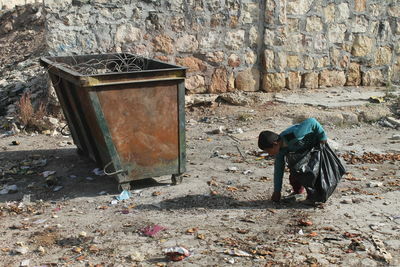 Just like other residents of the area, 10 year old Abdul Rahman, the oldest of his brothers, have to collect rubbish to burn as fuel for cooking and heating. Two of Abdul Rahman brothers are mentally unstable, and he has to support his mother to make a living. 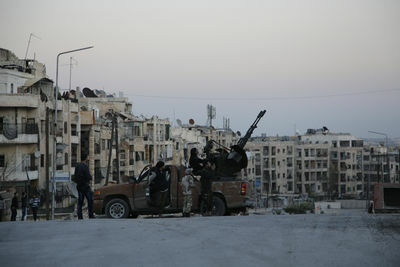 Syrian rebels in Aleppo man anti-aircraft guns to fire at attacking Russian warplanes. This video was taken on August 18 2016 following the bombing of the "Al Qatrgi" neighborhood in Aleppo by the Syrian Government. 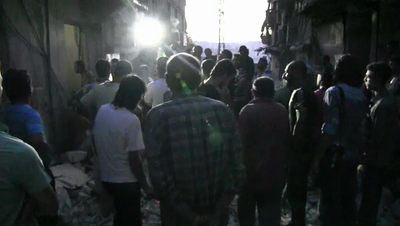 The shelling killed and wounded many of the residents of the neighborhood. In the aftermath of the bombing rescue workers dug out three children from the rubble, one of which was Omran Daqneesh, dubbed the "The Boy in the Rubble" after images of him taken from this video circulated online. Despite shelling and barrel bomb attacks, students and volunteer instructors are still showing up at al-Risala school in the rebel held Hanano area in the northern city of Aleppo, Syria. With no or little resources, the teachers are trying to give students a basic education in the absence of a school curriculum in areas controlled by the Syrian opposition. The school is located in a district which has been targeted in shelling and airstrikes. “The students and teachers are in danger, the building might be heavily damaged or even destroyed at any moment” says Ibrahim al-Ali, the school principal. “We have no choice but to keep operating at high risk. 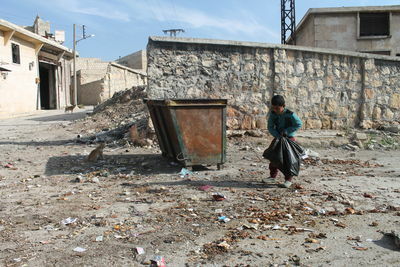 This is the situation in almost all schools in rebel held Aleppo”. “The number of students is good, but we are short of instructors. Teachers are not available. Q: What are your main needs other than for teachers? “I am the science teacher, I try my best to improve the scientific skills of the students whether in math or physics or chemistry. Q: How do you describe the student comprehension abilities? Q: Did you see any fighter jets striking? 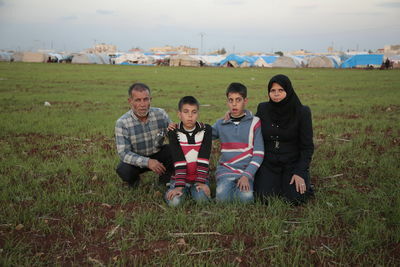 Fourteen year old Mustafa (L) and eleven year old Ahmed were born with neurological disorders. Fourteen year old Mustafa and his younger brother were born with a neurological disorder which requires they receive special care. Mohamed and his sons, Ahmed 11 and Mustafa 14. ÒWe stay inside the tent, if we are bored we come outside for some time and then we go back inside again. We have nothing to doÓ. Eleven year old Ahmed (L) and his older brother Mustafa, 14 were born with a neurological disorder and require special care. 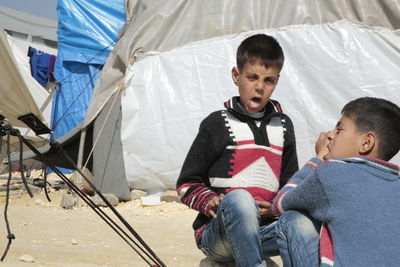 MohamedÕs fourteen year old son Mustafa plays marbles with other boys in the makeshift camp. It is the only form of amusement he and his younger brother have. 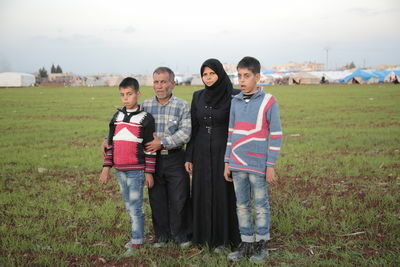 On the Syrian side of the Bab al-Salama border crossing to Turkey, the Turkish red crescent established a new makeshift camp to shelter refugees who escaped the airstrikes and battles in Aleppo. 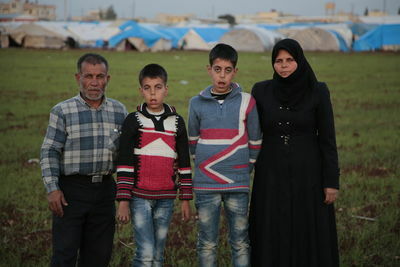 The Youssef family is among thousands of refugees who made it to the camp. The family has been through misery. “Some people haven't received a tent. In my case I could have been waiting for my turn till now”, says Mohamed Youssef, 46. 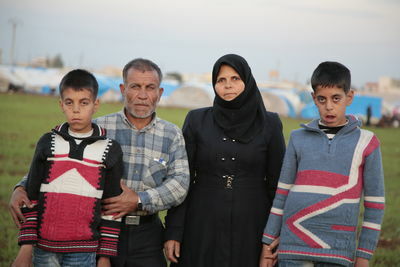 Mohamed who arrived with his wife Khadijah 43 and his two children Mustafa 14 and Ahmed 11, is feeling lucky just to have received a tent. Both sons suffer from a neurological birth disorder and they need special care. Before the uprising against the Syrian President Bashar al-Assad, Mohamed used to work as a delivery truck driver. Now he's jobless and has no income. 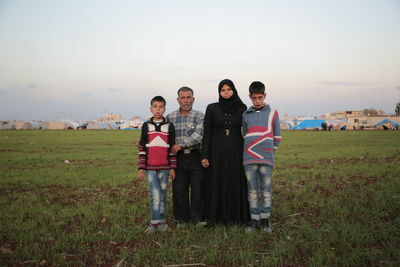 The family who lived in Minaq, in northern rural Aleppo, had to relocate to central Aleppo in 2012 when fierce fighting erupted between Syrian regime forces and the Free Syrian Army for control of the nearby Minaq Military Airbase. 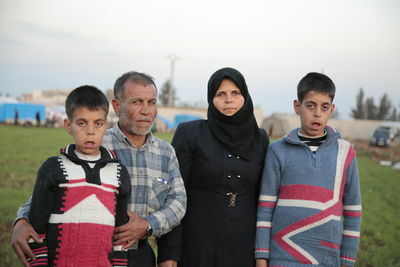 When the FSA took over the base and neighboring towns the family went back to their home in Minaq, only to flee again in February 2016 after the Kurdish YPD militia, backed by the Syrian regime army, launched an offensive and retook control over the area. “We stay inside the tent, if we are bored we come outside for some time and then we go back inside again, we have nothing to do”. Turkish authorities are keeping the border crossing near Kilis closed. 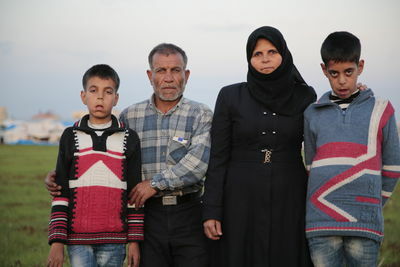 Mohamed, his family and thousands of refugees have no other place to go. They have been settling into the makeshift camp since mid February. Having not much to do, the children spend their day with neighbor friends playing marbles. This is the only amusement available to them. 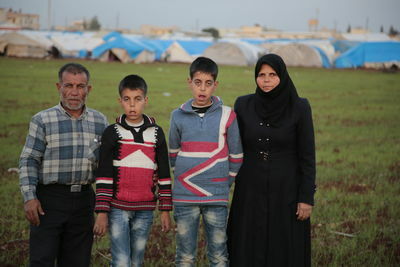 Mohamed: "Ask God to help us to go back home." Mohamed: “This camp is new, it’s only 20 days old. 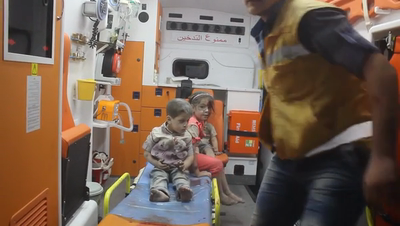 The Russian airstrikes are killing people in northern rural Aleppo, and the ballistic rockets. The kurds from one part, the regime from another part and ISIS from a third part. The airstrikes are focused on the northern countryside. They targeted each and every area and displaced all the civilians. People have no place to go but to this camp. There’s corruption everywhere here in the camp, I don’t know what to tell you, may God be with us.. Only people who have power can survive here. The rest of us have only God to help us. 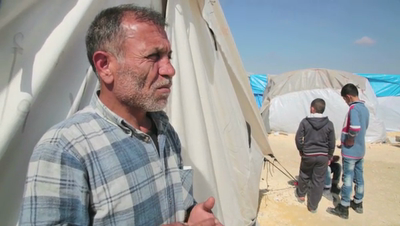 Question: “What’s the situation here did everyone receive a tent?” Mohamed: “Some people haven't received a tent. In my case I could have been waiting for my turn till now, but the person in charge came and checked on my situation and gave me a tent, otherwise I could have been waiting for my turn to come. Some people are still waiting for their turn.. They are now at 2130. My neighbor here is still waiting for his turn. He is sheltering with his kids under a plastic sheet. 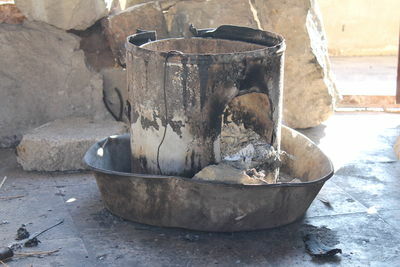 It is miserable inside the camp, lack of water, foodstuffs.. They brought some foodstuffs and distributed some of it. The rest no one knows about it. They also distributed some mattresses and carpets and no one knows about the rest. Only who has power here can survive. 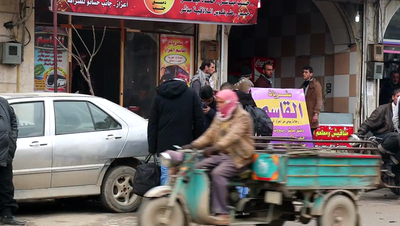 Aleppo residents take refuge in A'zaz on February 6, 2016. 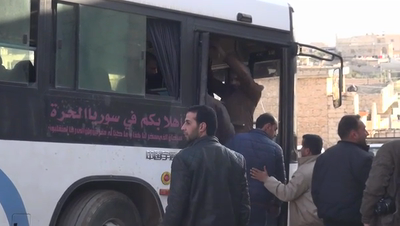 Footage shot on Feb 10, 2016 shows busses transferring refugees from rural areas in northern Aleppo to a safer place in "Dar Ta izzah" in the west of the city. The area has been bombed by Russian aircraft as military forces of the government of Bashar al-Assad try to encircle it. Thousands of people have fled the area and headed for the Turkish border. The Free Syrian Army was in charge of this transfer and had to coordinate with Kurdish forces and the al-Nusra Front to ensure the safe passage of the busses through areas that they control. 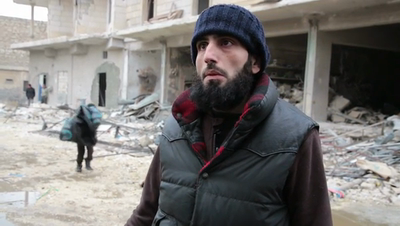 Video shot on February 6, 2016 inside the besieged rebel-held area of eastern Aleppo. The area has been bombed by Russian aircraft as military forces of the government of Bashar al-Assad try to encircle it. Thousands of people have fled the area and headed for the Turkish border. Those who choose to stay remain defiant. 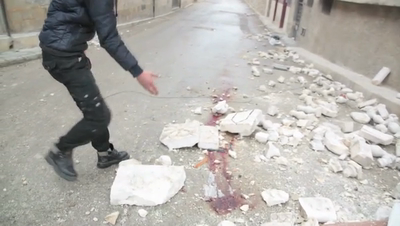 Video includes interviews with a Free Syian Army commander, Aleppo residents and a civil defense worker. “Yesterday after the Friday prayer we were stepping out of the mosque when the airstrike targeted our district which damaged these closed shops over here. Some of our neighbors were killed and others were injured. There were six dead and two injured. May God heal them. There is destruction all over the district. They were targeting the mosque but by God’s will the strike hit the neighboring shops. Video includes interviews with a Free Syrian Army commander, Aleppo residents and a civil defense worker.